The most insane day’s walk in Kahurangi National Park. It might be only around 7 km in a direct line to the Ministry of Works Historic Hut on the Mackay Downs, but even with the most vague track for checking rat tunnels up to the 500 m contour, and the open space for the last half kilometre it’s intensely demanding. The in-between points, well, a close encounter with the local vegetation. Full body immersion in the West Coast scrub. Few have managed the distance in just the single day, most seem to sleep somewhere along the way. Actually few have managed it at all. Since the early days of the MOW Hut, say 1985 when the current hut book was established, only around 50 parties have claimed to have done the trip in either direction. 50 parties in 30+ years. Yup, there’s a reason for that, it’s called serious scrub bashing. The middle of the Heaphy Track down to the coast at the Kahurangi Lighthouse/Keepers Hut and to the Anatori River, the end of the road down the West Coast from Collingwood. There are a few variations of this route, the Blue Shirt Creek route is probably easier to follow starting from the Heaphy Track end. Once you get into the vegetation north of the MOW Hut, well, make your own way. 32 km one way, Blue Shirt Creek on the Heaphy Track to the Anatori River. Best when there are longer and warmer days, ie, the summer months, November to April, you will need about 12 — 14 hours to smash your way through. This is one route where a decent map and GPS is essential. A GPS tells you where you are which is useful when there is no track and not much in the way of topographical features. And an ELB, an Emergency Locator Beacon. Buy the official paper maps from Land Information New Zealand, LINZ, Topo50 maps, both digital and paper: BN22 Kahurangi Point, BN23 Paturau River, just the first few kilometres along the beach, BP223 Heaphy Beach. Logistically it’s probably more sensible to start from the Heaphy Track, bookings are required for camping, ($15), or staying in the Heaphy Track Great Walk huts, ($32), and you can predict when you will be staying if you start from there. There’s a definite benefit in coming down from 850 m to sea level rather than climbing up through the vegetation. From Blue Shirt Creek there is a vaguely marked route to the MOW Hut, mostly rock cairns and occasional, (faded), plastic ribbon on twigs. That’s the easy part, through lumpy tussock. About 500 m north of the hut the tussock ends and there is a major scrub/bush bash for the rest of the way to the coast. Below the 500 m contour are some old cattle trails and an old DOC route with plastic ribbon that make it a little easier, but not much. From the Kahurangi Keepers Hut there is a 15 km walk along the sandy beach, with two major river crossings that can only be negotiated near low tide. The DOC Kahurangi Point route gets you along the easy part, along the beach to the Kahurangi Lighthouse/Keepers Hut to Anatori River. The rest, down/up the hill from/to the MOW Hut, well, you are on your own. There are two huts once leaving the Heaphy Track. 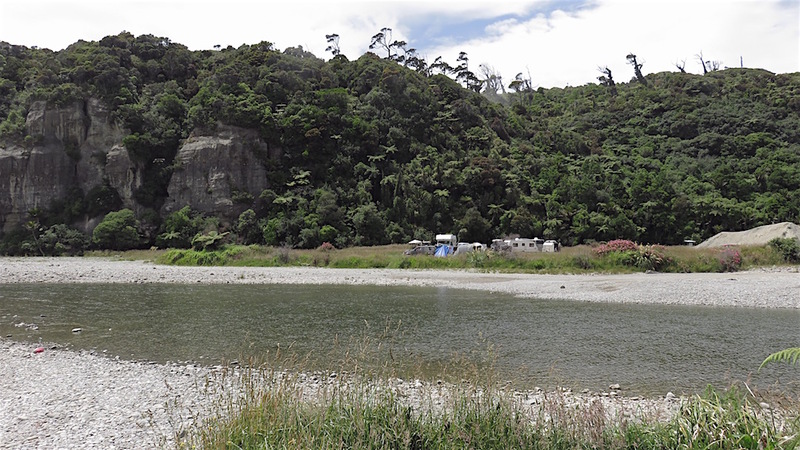 Note that the huts and campsites on the Heaphy are expected to be booked and paid for prior to arrival. That’s not so easy to organise coming from the coast unless you are able to keep to a schedule. There are no DOC tramping times indicated other than the 3 — 4 hours from the Kahurangi Keepers Hut to the Anatori River. See the Heaphy Track for tramping times on the Heaphy. There’s transport available to the start of the Heaphy Track. Nelson, Richmond, Motueka, or Takaka have the usual major supermarkets, either Countdown, New World, Pak’nsave, and Freshchoice for getting the main supplies. No track in a remote section of the Kahurangi National Park. It’s really only for very experienced trampers with a masochistic streak. Yeah, there’s an obvious reason why so few people do this. It’s super hard work. Better mention the lack of track, mostly there’s none, no markers either. It is all glancing at your map and following a compass bearing, or GPS. The landscape is entirely disorientating. There are no distinguishing features to be seen in the landscape for much of the way, just the vegetation immediately in front of your face. On the Mackay Downs the undulating terrain with tussock in the octopus style shallow valleys makes route finding a test. Once past the MOW Hut you have to force your way through dense vegetation for the best part of 10 or 12 hours. Gloves of the leather variety are entirely recommended, if not essential. It’s remarkably scratchy smashing your way through manuka or young rimu/kamahi, and at the lower levels in the forest there is cutty grass. Expect to pop out the other end looking like you’ve spent time in a cage of feral cats. There are very limited places to camp due to the slope and rampant vegetation. It looks close but man it’s slow going. Not much in the way of water, well, there’s the upper reaches of the Kahurangi River which is permanently flowing although just a small stream, and up the top closer to the MOW Hut is the flowing Juno Creek. The good news is neither of these would ever be much of an issue to cross due to the ability of the landscape to absorb water and run-off. Big River and the Anaweka River estuary are a different story. Big River is called that because it’s, err, big. Even crossing at low tide is somewhat of an issue, waist deep and flowing swiftly but with a sandy bottom that’s crossable on the 45°. The Anaweka is entirely tidal, no hope of crossing except a few hours either side of low tide. It’s worth checking the tides to avoid a long wait. Low tide is approximately 60 minutes after Nelson. It’s certainly not for anyone other than those fully experienced in off-track New Zealand conditions and full on adventure. As stated possessing an element of masochism would be advised. Here’s a 50 image slideshow from the Ministry of Works Historic Hut route giving an indication of the general route conditions and sights along the way, if you need any further convincing to find other things to do with your time. There’s a fair chunk not recorded because there was just scrub immediately ahead, and it was raining. The slideshow starts at the Anatori River end because, umm, that’s the direction I travelled the route, uphill. And I didn’t come down Blue Shirt Creek to the Heaphy Track, preferring the more direct, and twiggy, Monument Creek, err, I got lost up on the Mackay Downs despite the perfect weather and GPS. Images of the Ministry of Works Historic Hut route huts can be found in the other Kahurangi huts section.